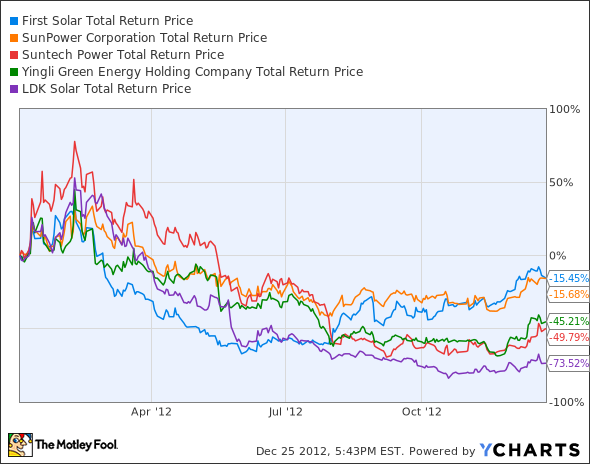 Fisker seemed to show some promise, and got a lot of government backing (as did the solar cell makers). There were also companies that made batteries for electric cars that saw similar backing. The share prices of these companies is being battered as either the market is just not proving to be there or there is fierce competition with cheaper workers in places like China. Any engineering junior worth his salt could show you the issue with solar cells. While they are nice for providing small amounts of power in places where it is difficult to connect to the grid – for example, for a highway sign or an LED light in your lawn – a simple calculation will show that enormous amounts of land area would need to be covered in solar cells to provide even a small amount of the domestic power supply (think covering half of Arizona in solar cells). These cells would need to be cleaned and maintained. This makes it a lot more expensive than using coal, natural gas, oil, and uranium. It would also require a huge number of batteries or some other way to store the excess power generated during good days to make up for the lack of power during cloudy days or night time. Finally, the places that are good for solar don’t include the high voltage lines needed to get the power to the grid – and this can cost tens of thousands of dollars per foot! The biggest issue is even if there were enough cells and the transmission lines were in place, the power would still cost more per kw-hr than that produced from fossil fuels and a lot more than that produced by nuclear. The technology needed to produce cheap solar cells with high efficiency that don’t require extensive maintenance is simply not there. Doing this on a massive scale simply won’t change that. Likewise, electric cars enjoy a huge government subsidy (something like $10,000 per car), and yet they still cost a great deal more than similar gas-powered cars. An all-electric car will cost $30,000-$50,000 even with the subsidy. A similar gas or diesel car will cost between $12,000 and $20,000. Even given that electricity is cheaper than gasoline, partly because the users of electricity don’t currently pay the gasoline taxes used to maintain the roads and partly because of the need for refiners to make all of the specialty blends for different regions of the country, one would never make the money back within the life of the car from savings on fuel costs. Electric cars also have a finite life span since the life of the batteries degrade with every charge and the cost of the batteries is significant, meaning there will be a lot of electric cars sitting in the junk yards in about 10 years while their gas-powered siblings are still running on the roads. Finally, electric cars actually require more fuel per mile than gas-powered cars. Once the batteries are charged, they run with an efficiency of about 30%, but the power generation at the power plant only has an efficiency of maybe 40%, and there are additional losses in transmission and huge losses in charging the battery (think of all that heat generated). This means that the efficiency of en electric car, from power plant to wheels, is less than 0.30*0.40 = 12%, compared with about 23% for a gas-powered car (and greater values for a diesel). This means the electric car is burning more fuel – primarily coal – than the gasoline powered car! Once again, having a lot of electric cars will not solve this problem. Many investors rushed into these companies, trying to cash in on the next big thing. The same thing happened when electricity was invented and power companies first started to spring up. The same thing happened when VCRs were invented, and when computers were invented, and when the Internet was started. In all of these cases, investors poured huge amounts of money into companies with no earnings and an unpredictable future. This lead to a bubble that eventually came crashing down, and a lot of the companies disappeared. Even the stronger companies that survived and went on to thrive (General Electric, IBM, Amazon) saw there share prices fall dramatically. The lesson here is not to chase bubbles as new technologies are invented. Instead, wait for the dust to settle and the clear winners to emerge. There will always be time to scoop up shares at discount prices once companies have started to make real earnings. Rushing into stocks because of worrying about being left behind leads to bad decisions. Most of the companies are in a load of debt and are only kept afloat by the Chinese govt. However, like you said, one company will probably emerge from the pack. Possibly SunPower, or another company if China chooses to bail out one while simultaneously eliminating their competition. You’re right that someone could make a profit if they bought in early and sold just as things were getting good. I’d rather take the sure bet of buying and holding after the dust settles than trying to guess if it will go from really high to really really high before it falls. I guess it’s less exciting, but your odds are a lot better.